While a pair of lightweights continue to dominate the UFC 118 headlines, the heavyweight scrap that will be opening up for Frankie Edgar and BJ Penn is a significant one for those contemplating a combat crossover in the future. 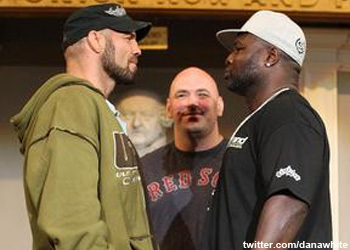 Although James Toney is the biggest boxing superstar to dip his toes in the mixed martial arts pond, Octagon Hall of Famer Randy Couture doesn’t feel he’s representing the entire sport of MMA when the legends collide tomorrow night inside the TD Garden in Boston. Because Toney is entering “The Natural’s” world, Couture will be a 7-to-1 favorite against the 42-year-old “rookie.” Despite his not-even-gonna-be-close status, Couture believes that if he were to get upset this weekend, it won’t change the fact MMA will continue to stare at boxing in its rear-view mirror. Besides the glaring differences in their styles, their approach towards pre-fight promotional hype appears to be on the opposite ends of the spectrum as well. Oh, no worries. Toney brought along his confident/borderline cocky boxing bravado to Beantown with him. As for Captain America, expect for him to violently welcome his outspoken counterpart into his new profession. Period.